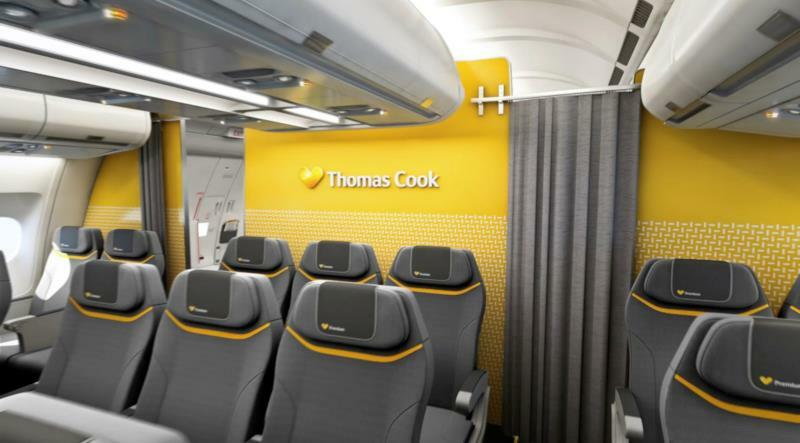 After being an “all economy” airline since its inception, Thomas Cook Airlines has been gradually adding a Premium Class cabin to many of its aircraft. 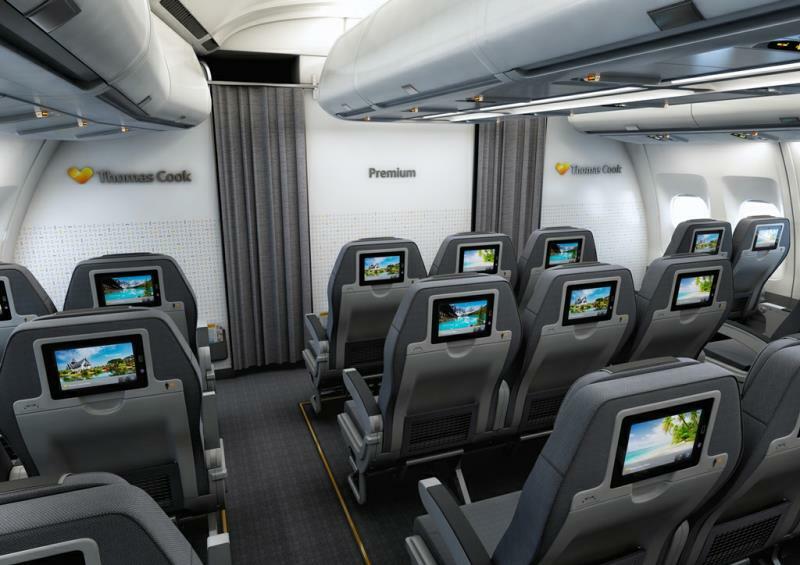 Positioned to compete with other airlines’ premium economy cabins, Thomas Cook offers 49 Premium Class seats in a separate cabin at the front of their A330-200 aircraft on many long haul routes. I traveled from Cancun to London Gatwick overnight, returning on a day time flight just over two weeks later; both flights in Premium Class. Checked baggage allowance: 1 x 25kg bag (1 x 32kg bag on flights to/from the USA). Priority baggage tags are attached to Premium Class luggage. 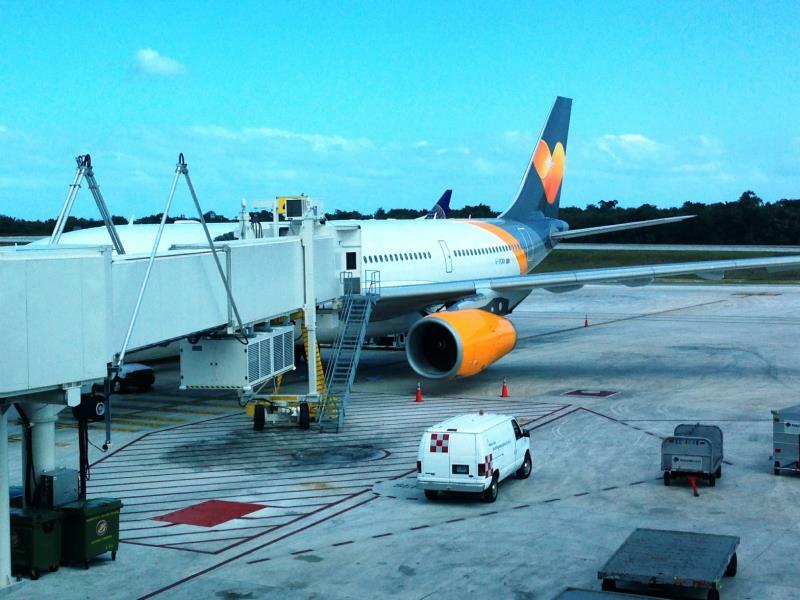 Check-in at Cancun Airport is in Terminal 3 (recently relocated from Terminal 2). A separate Premium Class check in desk is available, as are self-check-in machines. Check-in at London’s Gatwick Airport takes place in the South Terminal. A separate Premium Class check in desk is available, as are self-check-in machines. Since I was overnighting at a hotel in the terminal the night before my flight, I used Thomas Cook’s Sundown check-in service, available between 4.00pm & 10.00pm for flights departing before 12 noon the following day. The normal charge of £5.00 for this service is waived for Premium Class passengers. Using this excellent service meant I dropped off my luggage the evening before and received my boarding pass, leaving me free to head directly to security the following morning. No priority security line is offered in Cancun, however the line moved fast, and I waited less than ten minutes at the checkpoint. A priority lane is offered at Gatwick, and at 7.30am, I was literally the only one in the line, meaning I was through security within seconds of arriving at the checkpoint. No lounge access is included for Premium Class passengers; as always, I recommend Priority Pass to frequent travelers, as membership provides access to over 850 lounges around the world, including Cancun and London Gatwick. 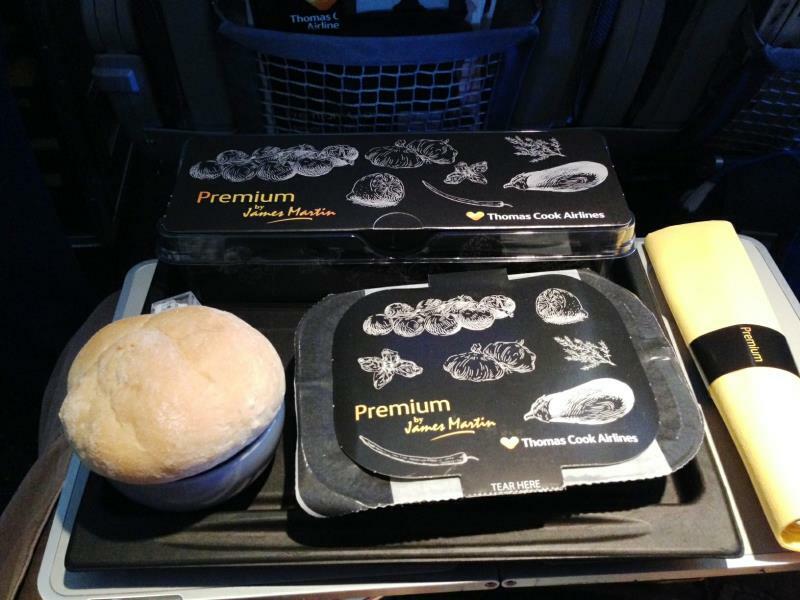 Both in Cancun and London, Premium Class passengers were called to board the aircraft first. Since boarding was in both cases through the second door on the left side of the aircraft, Premium Class passengers turned left when entering; Economy Class passengers turned right. This provided a calm environment in the Premium cabin, allowing Premium passengers to stow their luggage, take their seats, and enjoy a pre-departure beverage of sparkling wine, orange juice, or water, served with a packet of pretzels. In Cancun, a second round of beverages was also offered. 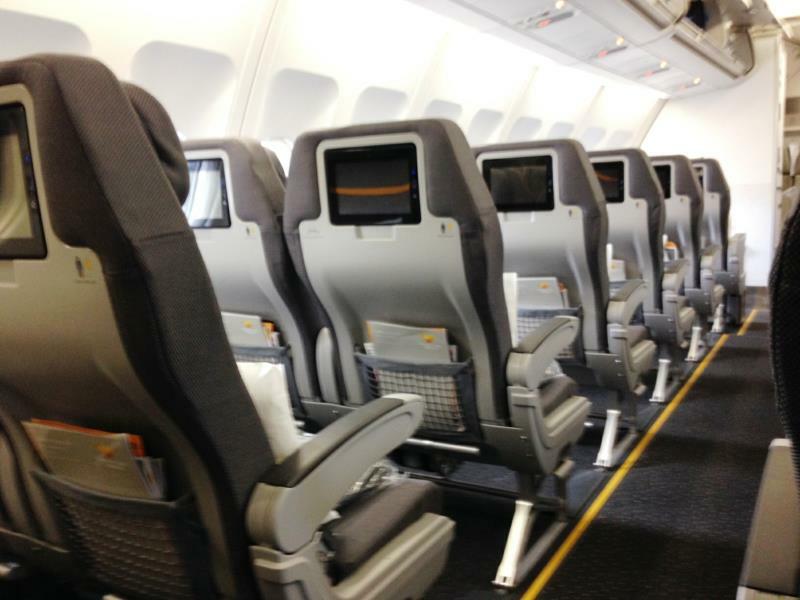 Thomas Cook A330-200 aircraft Premium Class offers a 35” seat pitch, with 19.7” seat width, configured 2-3-2. A footrest folds down from the bottom of the seat in front. Seats are equipped with the standard reading light and crew call functions, and each seat has its own seatback screen with USB port. Outbound, I sat in 3D; on the return, 7D (the last row of the Premium cabin) and found 7D to be superior, since it offered additional legroom (I would estimate 2-3 additional inches) due to the middle three seats being set further back, as well as an additional extending leg rest not provided on the other seats. It appears that on certain aircraft, 7D-E-F are sometimes used as crew rest seats (hence the greater space, and extending leg rest), therefore may not be available for passenger selection on all flights. A large pillow, blanket, and amenity kit (different design in each direction) containing eye shade, ear plugs, flight socks, toothbrush and toothpaste were on each seat upon boarding, as was a daily newspaper. 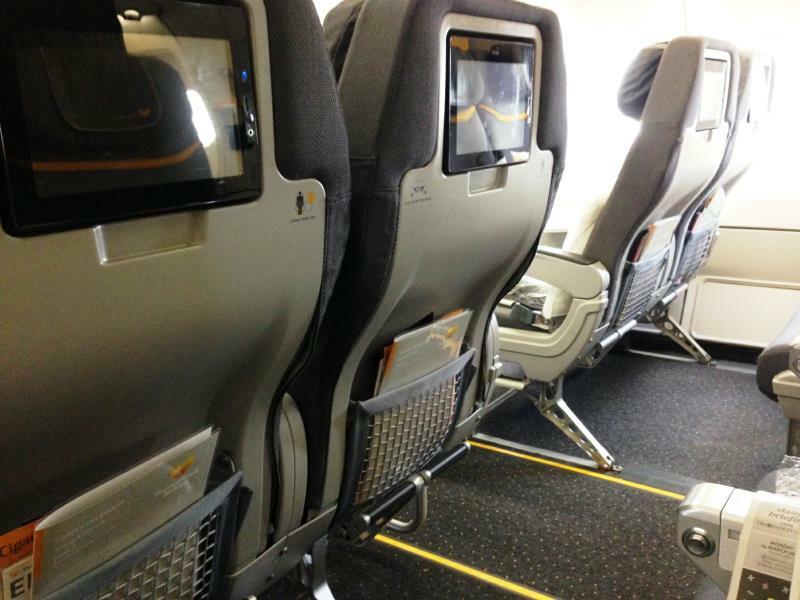 Each seat has a tray table which is stored in the armrest rather than folding down from the seat in front. The tables are strangely small and flimsy however; barely big enough for the meal tray, and don't even think of trying to use them for your laptop. The newly refurbished cabins look classy with their grey color scheme with orange accents, and the front lavatory is reserved exclusively for Premium Class passengers. On the Cancun – London flight, a bar service was offered soon after take-off, and I was served two miniatures when I ordered a drink. All alcoholic and non-alcoholic beverages (except Champagne) are included in Premium Class. This was the only full bar service offered on this overnight flight; however drinks were available throughout the flight upon request. On the daytime return from London to Cancun, several full bar services were offered in the cabin, as well as additional drinks upon request; on the daytime flight I noticed that only single miniatures were provided at each service, unless a double was requested. A wine service took place before the main meal in each direction, with a choice of red or white quarter bottles. 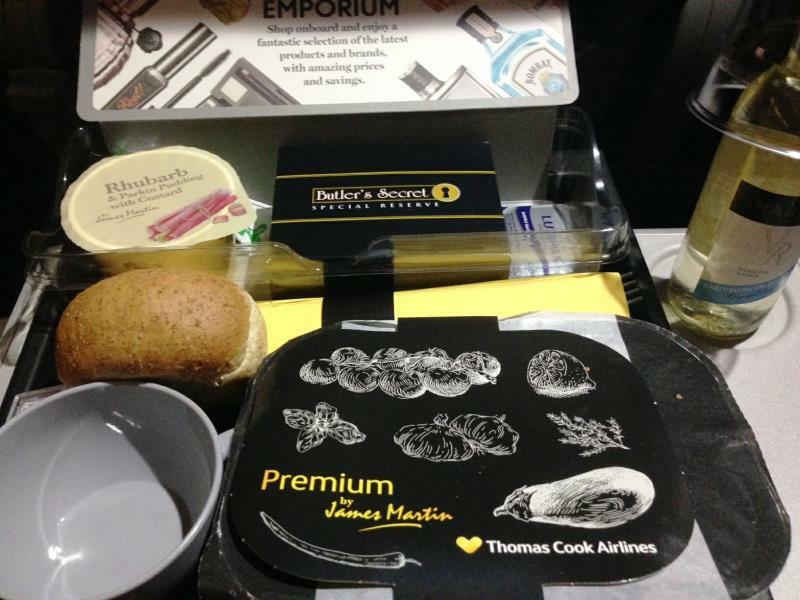 Premium Class meals are by Celebrity Chef James Martin, and are upgraded from those offered in Economy. 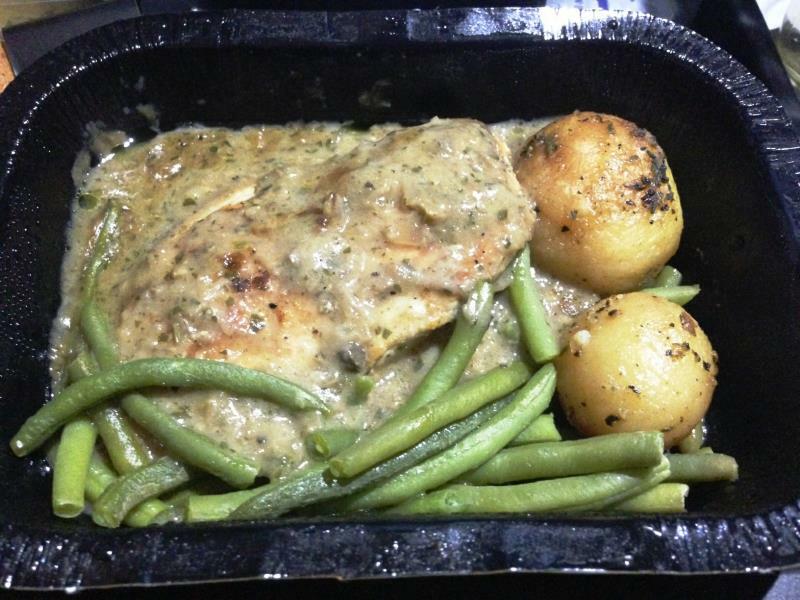 From Cancun to London, dinner was a choice of chicken breast in mushroom sauce with green beans and potatoes or Shepherd’s Pie. I chose the chicken, which was very good; hot and delicious. Bread rolls were served from a basket by the crew. Dessert was rhubarb and parkin pudding with custard, followed by crackers with two cheeses. The meal was followed by a coffee & tea service, with liqueurs on request. 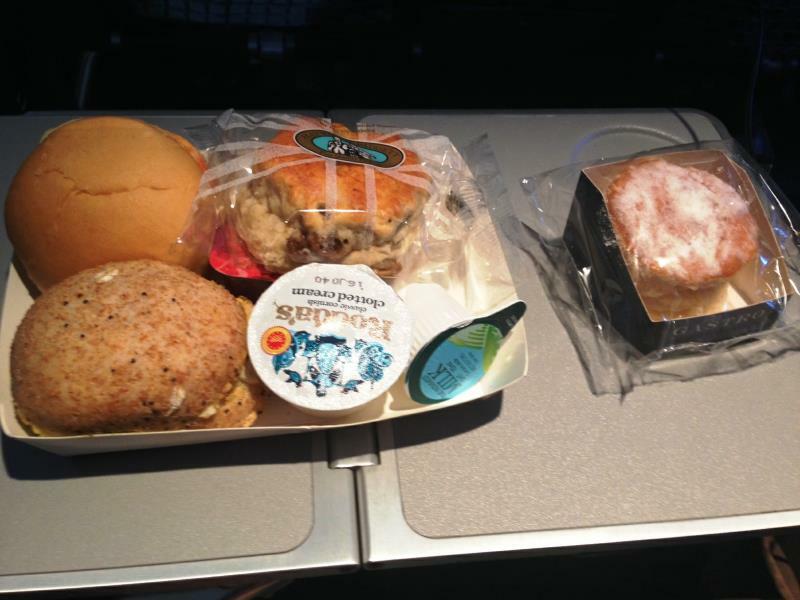 Breakfast was a muffin, served with orange juice and a pot of yoghurt, with a warm pain-au-chocolat served from a basket by the crew, and coffee or tea. 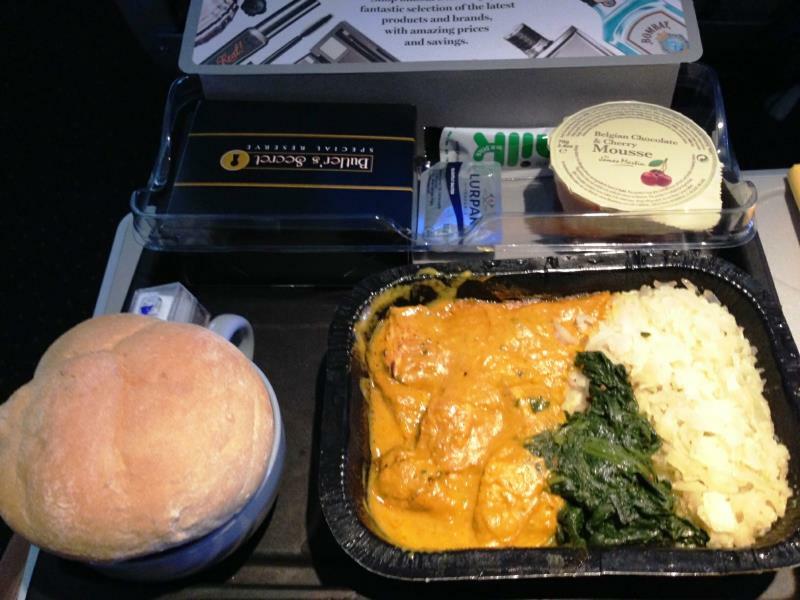 From London to Cancun, lunch was a choice of Goa style chicken curry with coconut rice and spinach, or braised beef with mashed potatoes and parsnips, and warm bread rolls served from a basket. I chose the curry, which was rich and flavorful. A luscious Belgian chocolate and black cherry mousse followed, with crackers and two cheeses to complete the meal, and then a coffee & tea service, with liqueurs on request. 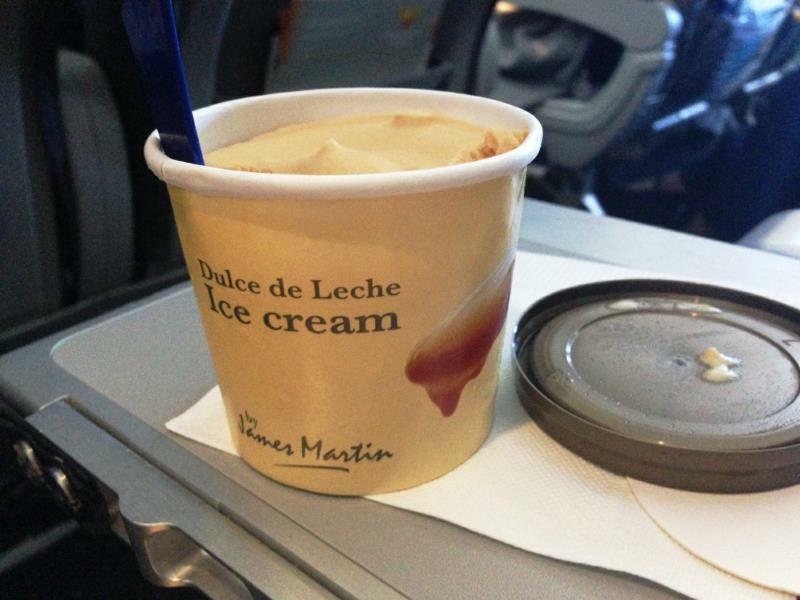 Mid-flight, a pot of James Martin dulce de leche ice cream (made by Salcombe Dairy, one of England’s premier ice cream producers) was offered. Before arrival in Cancun, afternoon tea was served, consisting of two filled rolls, a scone served with jam and Rodda’s clotted cream, and an individual sponge cake filled with lemon butter cream, along with coffee or tea. All food was of excellent quality and flavor. Premium Class passengers receive access to the full library of 30 movies and 50 TV shows, as well as an extensive audio library, and of course flight information, and the moving map. Passengers may use their own single-pin headsets, or use those provided onboard. 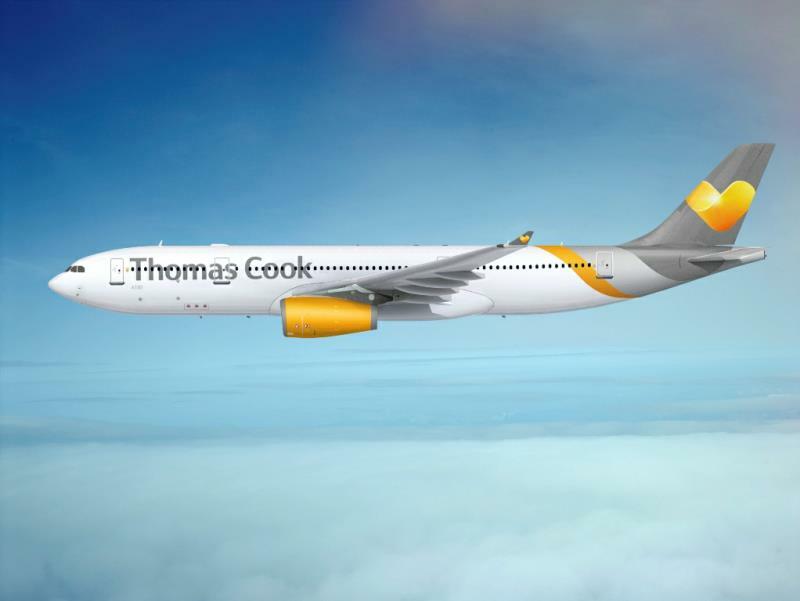 Thomas Cook Airlines friendly crewmembers provide excellent service, and are always available for any request. On each flight, before landing, crewmembers passed through the Premium cabin offering hot towels. On arrival in London, no priority disembarkation was provided to Premium Class passengers, with a free for all disembarkation through the door between the Premium and Economy cabins. 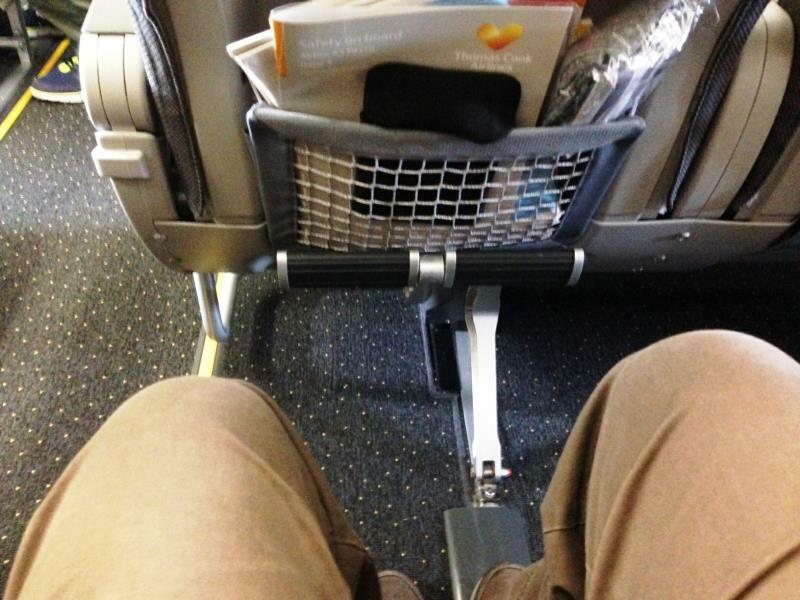 In Cancun however, Economy Class passengers were held back, allowing Premium Class passengers to disembark first. Priority baggage tags appeared to work; in London my bag was one of the first to appear, while in Cancun, it was among the first batch. 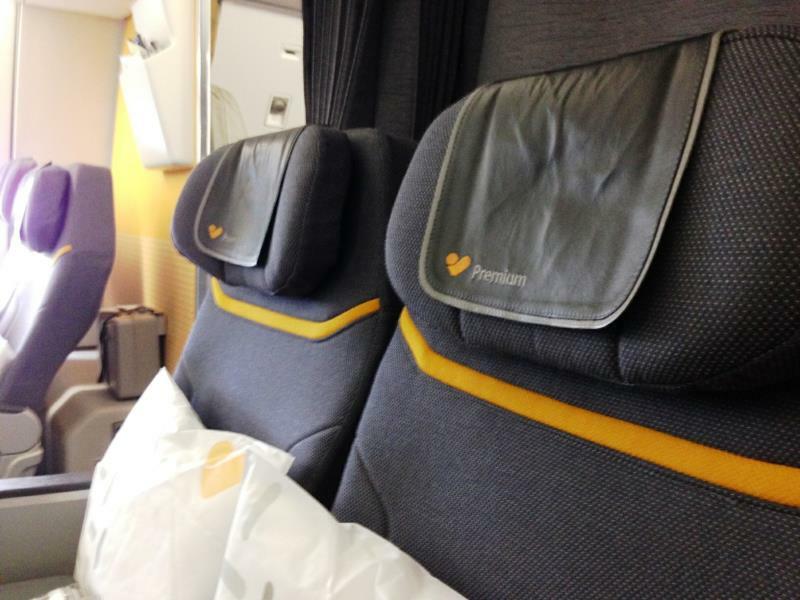 Thomas Cook Airlines Premium Class offers extra comfort and features, at a very competitive price. It’s a great upgrade for those looking for some extra space and amenities. When flying this route in the future, it will be my first choice. 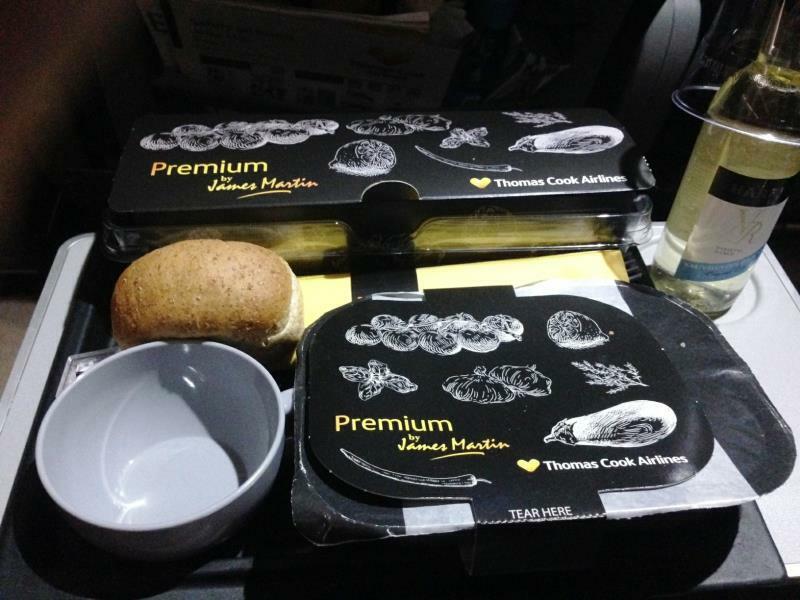 I’m definitely a fan of Thomas Cook Premium Class. Premium meals by celebrity chef James Martin, including premium brands such as Salcombe Dairy Ice Cream and Rodda’s cream. All drinks (except Champagne) included. Priority check in and security clearance (at most airports). Slightly inconsistent service between outbound and return flight (i.e. priority disembarkation). Small flimsy tray tables are inadequate. Comfort and style at a bargain price. 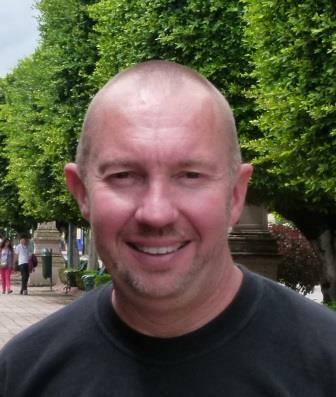 Stewart Mandy traveled in Thomas Cook Airlines Premium Class at his own expense. 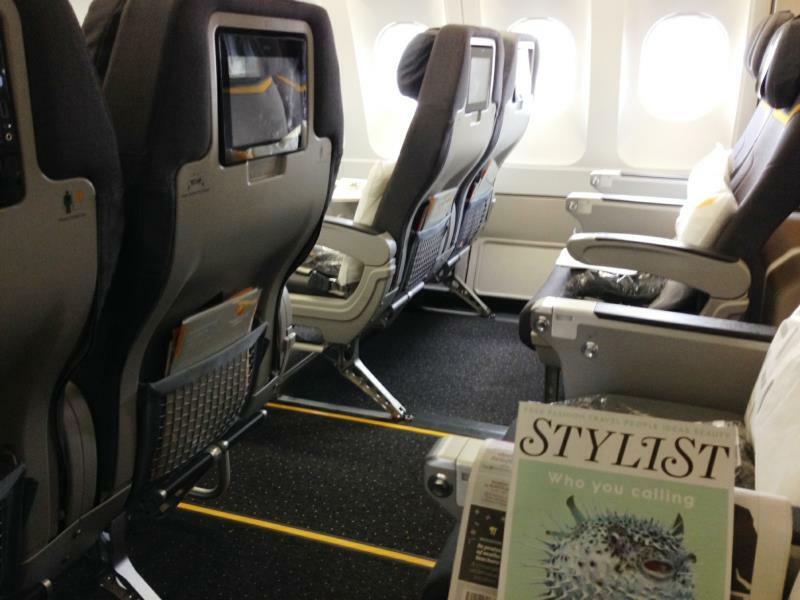 To read Stewart Mandy's review of Thomas Cook Airlines Economy Class, click here.